The international treaty that governs the exploration and exploitation of space by the members of the United Nations forbids the placing of weapons in Earth orbit or on other astronomical bodies. One of the great fears is that a space faring nation could place nuclear weapons in orbit which would give it an advantage in a possible exchange of nuclear warheads with another country. However, there is a situation in which it might be critical to humanity to have nuclear warheads in orbit around the Earth. Asteroids are minor astronomical bodies which are not big enough for gravity to pull into spherical shapes. There are three main types of asteroids. The E-type asteroids are composed of carbon compounds. The M-type asteroids contain metals such as iron and nickel. And the S-type asteroids are stone composed of silicate compounds. There are millions of asteroids in the solar system. Many of these orbit between Mars and Jupiter in what is referred to as the Asteroid Belt. There also many asteroids in the inner solar system which cross the orbit of the earth. Once in a while, one of these near-Earth asteroids crashes into the Earth. The bigger the asteroid, the greater the destruction. A big enough asteroid could cause global firestorms, earthquakes, and tsunamis. The amount of water, dirt, and smoke ejected into the atmosphere by such a collision could cause global cooling by blocking sunlight, disrupting the climate for years. Such asteroid impacts have happened many times in the past with devastating results. NASA is currently monitoring asteroids that could pose a threat to the Earth. Over 16,000 asteroids that regularly cross the orbit of the earth and may pose a threat in the future have been catalogued by NASA. NASA and its European counterparts are most concerned about asteroids that are 450 feet or larger because the impact of such an asteroid on Earth could destroy a large city. Although smaller asteroids are less of a threat their impact could still be quite serious depending on where they landed. One of these smaller asteroids came within 30,000 miles of the earth back in February. Yesterday a large asteroid passed within 1 million miles of the earth which is about four times farther away than the orbit of the moon. This asteroid was about two thousand feet across and could’ve caused serious devastation if it had hit the Earth. At this stage of our technological development, it would be difficult for the human race to do anything about an asteroid approaching on a collision course with the Earth. 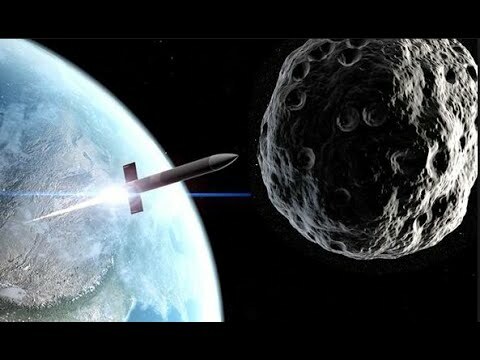 The best current option for deflecting an asteroid is the use of multiple existing nuclear warheads or the creation of special huge nuclear devices for this specific purpose. The big issue with such a mission is how much time we would have to prepare. In some cases, we are able to identify and chart asteroids that are headed our way years ahead of a possible collision. In other cases, we might only have hours warning of an impending collision and too little time to prepare a response. There are estimates that it would take at least five years time to prepare a mission to destroy or divert a major asteroid with today’s technology. Another problem is that some asteroids are not single objects but lose conglomerations of many smaller objects. If an explosion was not sufficient to push all the smaller objects away from the Earth, it might just be a case of trading one single large impact for many smaller impacts. The NASA Planetary Defense Office (PDO) and other organizations such as the Federal Emergency Management Agency (FEMA) have held simulations of asteroid strikes. If a major asteroid was found to be headed towards the Earth and an impact was inevitable, the NASA PDO, FEMA and other and other federal, state and local agencies would spring into action to prepare for the impact and to pick up the pieces afterward. An additional danger of an unexpected impact of a major asteroid in a country armed with nuclear weapons is that such an impact might be mistaken for a nuclear attack and trigger a nuclear war with a nuclear-armed enemy. It is ironic to consider that a device that has threatened the very existence of the human race for decades might ultimately be the Savior of human civilization.